While I was working on the latest update I was finally able to get my hands on a MacBook Air to do some testing for the Mac version of Fumiko. 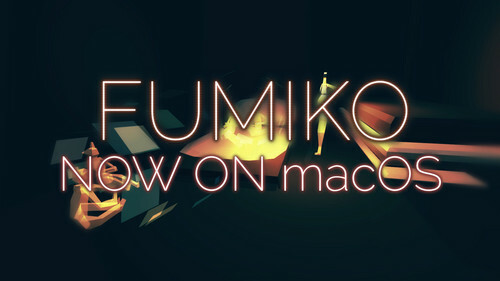 For this reason I'm now proud to release Fumiko! on its third platform yet - macOS. The minimum system requirements will be a bit lower than that, an i5 or i3 should be totally fine, but an actual graphics card or performant chip is required to play Fumiko. The game ran fine on the machine tested above. The minimum graphics card required for a PC is a GT 520, which is a reaally old graphics card with minimal specs. The game does not require huge power, but the difference between having a dedicated card and only a cheap chip is noticable. Fumiko was tested on an Intel Core 2 Duo and ran fine. I don’t own the hardware to test the game on older mac hardware, but I think as long as it is comparable to the minimum specs (Steam) required for PC (Windows or Linux), it should work just fine. Thank you for coming by and make sure to check out the Fumiko! Demo! See you soon!